This is a project involving the Particle Photon a tiny wi-fi development micro-controller to create a home security system. The reasoning for developing this system is to prevent anymore break-ins at my grandparents house. They no longer live there, but the property is still in their ownership and it is burglarized quiet frequently. This system was created as a cheap alternative to the expensive commercial value home security systems. It works by reading the voltage change from the magnetic contact switch. When door is closed the contact switch is close enough together that it will keep the system closed resulting in a full transfer of the supplied five volts. When then door is open the switch opens resulting in a loss of voltage down to five hundred millivolts. Through the code the system reads this voltage change and publishes the door status to that of being open. An when the door is shut the code is to do nothing. Through the IFTTT software when the Photon publishes an open door status the software sends a notification to your cellphone. Error and uncertainties associated to this system are mainly within the connection speed of the wi-fi being used. Other uncertainties come with not knowing when the system is on or off unless connected to the tinker application. If there is a loss of home power the system will not operate. Other errors for this systems are associated with the change in voltage could not be detected if change is small enough. Limitations can be the speed of the wi-fi being used also the user must be connected to the internet on their cellphone in order to receive the notification. Other limitations include the system must be powered from a house outlet in order to operate also it only provides information on if the door is open or closed not for how long. Commercial Value of this system includes being a cheap alternative to other security systems also it can be used to determine if draws and cabinets are opened. The system gives real time updated information of your door status. A big contributing factor to industry use would be the fact that maintenance and instillation are very easy for this system. For the next project of this magnitude I will defiantly incorporate more sensors and include a camera. The camera would be used for if the sensor was triggered the camera cuts on and starts recording in real time the area being intruded. 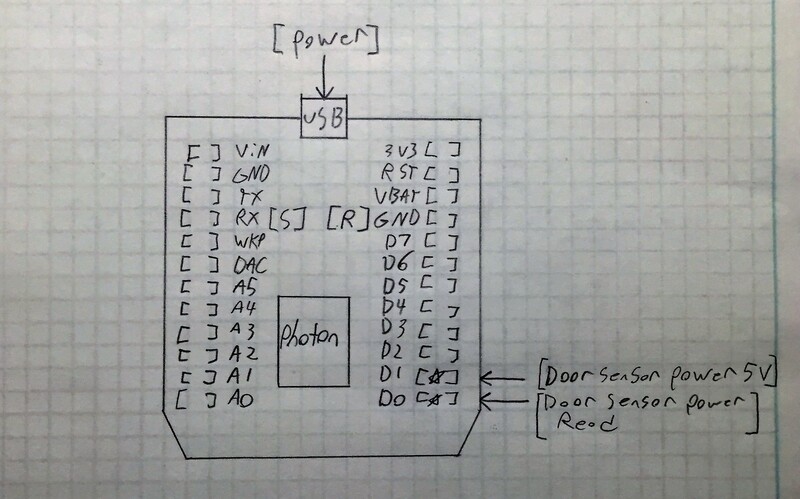 This was the code written in order to communicate the response of the magnetic sensor to the Particle Photon.